Lord of the Fries pairs with Liven in three convenient locations- Glenferrie Rd, Chapel St and Elizabeth St exit. Visit either for your quick fix of fresh, delicious and premium quality fries. Open for lunch and dinner everyday- and for a late night snack after your night out on Fridays and Saturdays. 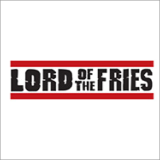 Lord of the Fries was created as a stand against the frozen, chemical packed fries that fill the fast food industries. Instead they aspired to create the perfect fry by all accounts -with absolutely no nasties. And this is exactly what they did. Fresh, golden, crunchy fries served with a series of delicious sauces from all over the world. Since then, the franchise has spread, and the menu has grown- now offering delicious burgers, sides and hot dogs too. The best part is that Lord of the Fries is for everyone! Their food can be vegan, vegetarian, kosher and halal. They offer above and beyond the normal options for vegetarians and vegans, with veggies burgers, vegetarian nuggets, hot dogs, onion rings and even vegan shakes. Visit Lord of the Fries for delicious fresh fries and fast food for all, that will quickly become your favourite feast.